LGBT Labour #GE2017 Cabaret Extraordinaire! KU BAR is hosting a fundraiser in order to support our LGBT community and the Labour Party. Trudy Howson, LGBT Poet Laureate, will be performing some of her poetry. There will be live acts, DJs and a special guest speaker! May 17th also coincides with International Day Against Homophobia, Transphobia + Biphobia. What with the recent events in Chechnya there is not better time for us to come together and remind ourselves what LGBT Labour stand for!! 3rd Part of the Poem Tryptch (Red/Orange) for Flying Pig Productions. The poem “We Are” will be the last poem in this series. 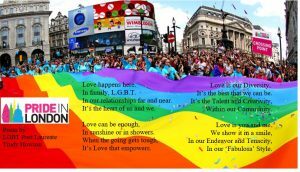 Monthly LGBT Poetry evening, in an iconic West End venue. Feeling Frisky? Celebrate Spring at INCITE@The Phoenix. I host and perform my work at this longstanding LGBT social highlight. Its held at an exclusive theatrical members club just off Charing Cross Road. It celebrates poetry as diverse as our community is. Its a cultural/social event with a flirty vibe! Free Club membership for the night. Excellent food and drinks served in the club. Friendly theatrical ambiance. As well as performing my own poetry, I have two invited guest poets each month. Marcus Reeves: Man behind the mask revealed in poetry and music. Plus our popular open mike section after the interval. Entry is free, but there is a collection for the artists.